SPIE International Year of Light Photo Contest. 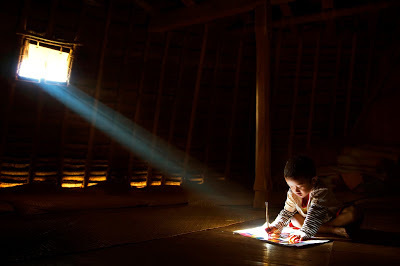 A photo of a 5-year-old boy studying in a dark hut, with only natural morning light streaming through a small window, has been selected for the People's Choice Award in the SPIE International Year of Light Photo Contest. 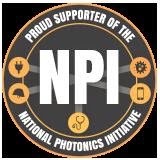 The contest was sponsored by SPIE Professional, the quarterly magazine of SPIE, the international society for optics and photonics, as part of the International Year of Light observance. SPIE is a Founding Partner. Captured by Javanese travel and landscape photographer Handi Laksono, the winning photo was taken after Laksono hiked three hours to the remote village of Wae Rebo on Flores Island in Indonesia. Wae Rebo's only lighting source is solar, either direct sunlight or a few small solar panels, Laksono said. He noted that the solar panel in the house he visited powers a single light bulb that is used only for a few hours in the evening. "For the children who wish to study in their houses in the morning, the light from the small windows is the option," he said. See more of his work in Laksono’s portfolio. 'People's Choice' highlights: Go solar!